Virtualization, cloud computing, and wireless technologies are fundamentally changing enterprise computing, providing revolutionary gains in productivity and cost savings. They are also driving a complete rethinking of enterprise networking architectural strategy. The well-documented impact on these disruptive technologies affect everything from server strategies to power requirements. However, one of the most affected areas-the enterprise network access layer-has been left out of the conversation. In today's virtual enterprise, access to corporate resources must be secure, reliable, and manageable, with consistently enforced policy while simultaneously allowing access from anywhere at any time. This is why access network strategies have become critical to business growth. If IT can empower every remote worker with the full capabilities available at headquarters, the business can differentiate itself and directly influence the company's bottom line. 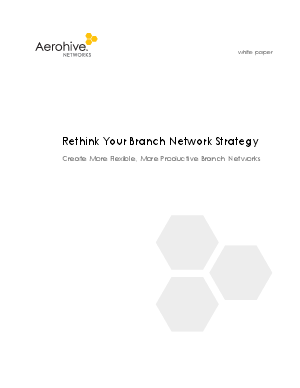 In this paper, we examine the requirements of providing and supporting a secure, robust, accessible remote network. Instead of returning to the costly inflexible network architectures that have traditionally been deployed, we will show how enterprises can benefit from a cloud-enabled approach that pushes mission-critical security and functionality beyond the confines of the corporate headquarters; provides the flexibility and business agility needed to meet remote worker needs; and does not require "big iron" equipment to deliver but instead off-loads compute-intensive tasks to the cloud to redefine the economics of deploying remote networks.